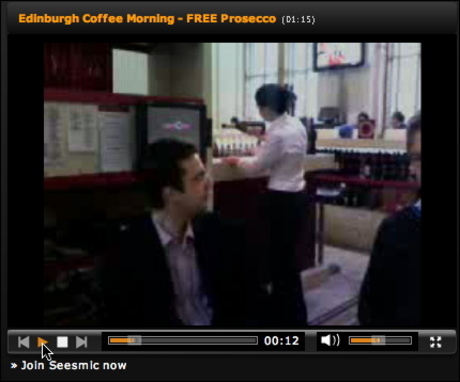 Today's Edinburgh Coffee Morn had a double-digit turnout. And many thanks to Victor and Carina for the complimentary Centotre Prosecco and Panettone. It quite got everyone into the swing of things. Thanks too, to Hugh, for giving Ewan, some signed Stormhoek prints, which Santa Ewan distributed to coffee morningers, as early Christmas presents. Not a bad start to the day and it's only 09.05 am. What a fantastic end to the year for the Edinburgh Coffee Morning. 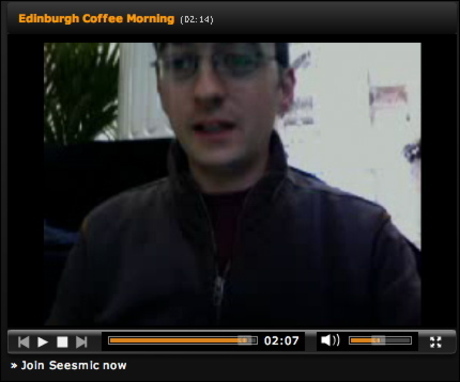 Hi Mike - I really enjoyed watching these seesmic videos unfold via @ewanmcintosh twitter messages from the land of Oz. Did Ewan use a web cam, mobile ph or video camera to produce this? 200/26 I know what this means. It's okay. Don't worry about it. I'm just using my blog to track/aggregate my wt/bmi.